I've been making my own lip balm for a few years now, and I love the recipe I use so I thought I'd share it here. It's very, very simple. This makes about 3 tubes. Melt wax and jojoba oil together in the top of a double boiler, or you could probably put it in the microwave for a bit. Stir to combine. Then remove it from the heat and add the essential oil. Pour into your containers, but don't fill up completely yet. Wait a minute or two, keeping the reserved mixture melted, then top the containers with the rest of the mixture. This gives you a nice looking top. Let cool for about 20 minutes and enjoy! I like a bit of a waxier lip balm, so if you want it glossier just add a bit more jojoba oil.. maybe 3 tsp? Experiment to get it how you like it, that's half the fun! There's been a few questions, so I thought I'd add my answers here so they're all in one place. -Where do you get those screw bottom containers? -How do you pour the balm in the tube? Do you just pour it from the pot? I used to use a plastic pipette to get the melted balm into the tubes, but I found a little enamel pot at the flea market and I use that now. The pipettes work fine but the balm will harden in it if you're not fast enough. You can also find these on ebay. Search for "plastic pipette." -Where do you get your beeswax? Online? Or can I use the left over wax from my honey and just try to remove the remaining honey? I buy my beeswax from Mountain Rose Herbs or from local beekeepers (check farmers markets). Often they will have little chunks of wax by their displays of honey. I don't see why you couldn't use the wax that's in honey.. I've seen other lip balm recipes calling for honey but whenever I try it the honey separates from the balm, but if you get most off it should work! -Any suggestions for what type of beeswax to use or where to get it? I noticed "pure," "unfiltered," "pellets," and all other sorts online. What's the difference? I would take the term "pure" to mean it's just beeswax, no other ingredients are added (also look for 100% beeswax). Filtered would mean that it's been strained of any other matter that may be in the wax (dirt, dead bees, etc). For use in lip balm I would look for filtered. One type of beeswax I would avoid is the "white" beeswax. The whiteness is obtained by bleaching the wax and I would think some of the many good, healing qualities of the wax would be lost when it's bleached. And I would be worried that some of the bleaching residue would remain on the wax. I buy everything from Mountain Rose Herbs and I'm always impressed. They're the best company I've found that sells this type of supplies and I love that most everything is organic. They also supply lots of information. You can find the jojoba oil and the peppermint essential oil there as well. -What sort of other oils would be nice in the lip balm? I’ve seen different lip balm recipes calling for different carrier oils, including: olive oil, safflower oil, almond oil, castor oil, coconut oil, and sunflower oil. Sometimes they’re combined in one recipe; like castor and coconut oils; or almond, olive, and castor oils. I’ve never tried any of them because I love the jojoba oil. And as for essential oils, I would think the citrus oils, like grapefruit, lemon, lime, or tangerine would be nice. Stick with edible stuff.. I don’t think lip balm scented with fir needle essential oil would be good, for example. Also be careful which oils you choose, some need to be avoided if you’re pregnant and others can’t be used on your lips or other sensitive areas. Mountain Rose Herbs has all of this information with their essential oils. -Do you know about any laws in selling lip balm to say a local co-op? No, I’m not familiar with the laws regarding selling products you’ve made. I would think some sort of preservative would be necessary, like vitamin E or grapefruit seed extract but I could be wrong. That is neat! Where do you get those screw bottom containers? I've used this recipe and added a little bit of lipstick for a tinted balm. Thanks a lot for the details instructions and recipe. How do you pour the balm in the tube? Do you just pour it from the pot? Rina, you can use a dropper to get it into the tube. I would recommend using a disposable dropper, so u don't need to worry about getting the smell of or anything. I just found you from a link in the Grist column. I've been thinking about making my own lip balm for a while, so I will definitely be trying your recipe out! Where do you get your beeswax? Online? Or can I use the left over wax from my honey and just try to remove the remaining honey? The pipettes work fine but the balm will harden in it if you're not fast enough. Maxine, I buy my beeswax from mountainroseherbs.com or from local beekeepers (check farmers markets). Often they will have little chunks of wax by their displays of honey. I don't see why you couldn't use the wax that's in honey.. I've seen other lip balm recipes calling for honey, but whenever I try it the honey separates from the balm, but if you get most off it should work! Any suggestions for what type of beeswax to use or where to get it? I noticed "pure," "unfiltered," "pellets," and all other sorts online. What's the difference? Sarah & Patrick - I would take the term "pure" to mean it's just beeswax, no other ingredients are added (also look for 100% beeswax). As for where to buy the wax, I really like mountainroseherbs.com. I buy everything from them and I'm always impressed. You can find the jojoba oil and the peppermint essential oil there as well. Thanks! In our salty, windy lives I think our lips have just stopped producing moisture. I guess they figured "what the point?" We've been enjoying burt's and plum pure, but I like the idea of making our own. Hi, i get very bad chapped lips and most of the time burnt lips no matter how much other lip balm i buy, my friend she started making Lip balm a couple of months ago and it has really worked for me, and i saw your recipe and gave it a try, i was just wondering what sort of other oils would be nice in the lip balm? Do you also make your own facial cleanser? I just found your site, and quickly added it to favorites. I am going to enjoy exploring it. Thank you. How many tubes of lip balm does this recipe make? And do you know about any laws in selling lip balm to say a local co-op? Re: what sort of other oils would be nice in the lip balm? Re: Do you also make your own facial cleanser? I haven’t tried making facial cleanser yet but it’s on my list! I would love to eventually get completely away from conventional products. Re: How many tubes of lip balm does this recipe make? And do you know about any laws in selling lip balm to say a local co-op? How long does it usually take for the wax to come? if you were going to sell your lip balm what would you sell it for? ive made some and i love it i wont buy any thing eles from now on. thank you!!! This is a very good project which can be made by anyone. good luck on staying more green!! Hi! Thank you for this info - I love to make my own lip balm too! I have not yet tried jojoba oil but its now on my to-do list. Some recipes say you need both soft and rigid oils - some recipes are much better than others and some of my batches are way better. I use a plain small vision wear pan with a handle and pour spout. I only heat the beeswax and oils enough to barely melt them then I blend them as well as I can and poor them into a small jar. Once the balm hardens, if you want to keep it real simple, you can just shove the lip balm tube into the oil in the jar and if it is warm and soft enough it will just cram in there without use of a pipette thingy, whenever one of my tubes runs out of balm, I just shove it in the jar and easily reload it, just from the pressure. When it gets warm, like sitting out in the sun, it packs in just like it had been poured into the tube. I LOVE Mountain Rose Herbs - I get my organic coconut oil from them - and a lip balm with wax, cocunut oil and safflower oil has been pretty good for me. I don't like flavors like peppermint or lemon or any others noir the SPF because I don't want ANY tingly stuff,, the coconut oil gives it a pleasant enough taste for me. A good lip balm should be nothing but "ahhhhh" that wonderful soft moisturizing feeling. I was wondering if anyone knows a tube made from recycled products. I know Burt's Bee's makes their lip balm with them, but I just want the cases so that I can make my own balm. I've sworn off plastic, so I can't--in good conscience--by the plastic tubes. Any ideas?! Thanks so much. You seem like a kindred heart. Keep sharing :) I'm going to make this as soon as I assemble all the ingredients this week. Increased Joy to your life! This is a (another) great post! I'm loving your blog so much (just found it while searching for lip balm recipes and went through the other posts too, lovely)! I'm in the process of Going as Green as I can and lip balm is next on my list. Can't wait for tomorrow to make some (still need some ingredients). Keep up the good work! I'm sure many people aside from me love it and find it very useful! I write for a magazine called M.O.O.D Magazine (moodmag.org) and I would love to feature your recipe for lip balm in my article on homemade beauty products. Is this ok? I would credit you and your blog, of course. I was wondering it this balm melts if you carry the tube around in your pocket....? Thanks for the recepi and how to's. I just tried your recepi and am waiting for it to harden in the tubes. I am thrifty also and just pushed out the old petro-based pore clogging lip balm from the store and reused the tubes. Can't wait to try it. I love Jojoba oil like you. I add Lavender , Frankincense, Tea tree and Geranium essential oils to Jojoba oil to make rejuvinating beauty oil. My age spots are fading and I believe my skin looks healthier and plumper. I got the hint from the moisturizing oil they sell at aroma therapy shop. They say Jojoba oil has natural sunscreen effect also. I like it because it doesnot leave a greasy feeling but just right moist protection on my face and neck. It's so easy to concuct something so good and effective and you know for sure that you are not putting on any chemical preservetives or petroliem products. They are for cars and not for my skin! It's not easy to go green all the way right away, but I am going to keep trying little by little. Great to know there are people trying and sharing the experience. I have been looking for recipes for this for two hours coz i need a gift idea for my mum... u hav just saved my life! This recipe is simple with hardly any specialised ingredients. I LOOOOOOOOOOVE U! I make lip balm a lot and I found that Rustic Escentuals has really good prices for beeswax and lipbalm tubes. Also DO NOT add grapefruit essential oil or an citrus essential oils to your lipbalm because it is photosensitive. This means that it will actually attract the sun to your lips! The only citrus essential that is not photosensitive is sweet orange essential oil. Also I'm going to try out this recipe today, can't wait! 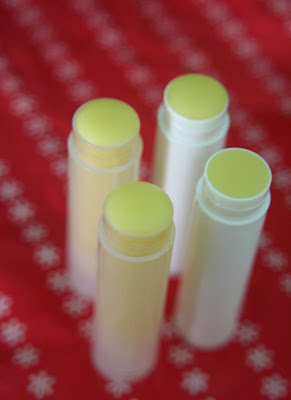 I've been making lip balm for awhile and found that Rustic Escentuals has reasonable pries or beeswax and lipbalm tubes. Also DO NOT add grapefruit essential oil or any citrus oils to your lipbalm! Citrus essential oils are photosensitive as in they attract the sun to your lips! The only essential oil that isn't photosensitive is sweet orange eo.Lastly great post! Can't wait to try out this recipe! Does it matter if i put olive oil insted of jojoba? this sounds great I really want to try it. Wish I could pin it though, guess i'll just have to write it down lol hopefully I wont loose it. I can save the link but for some reason I never find them on my pc again. Anyway thanks it really sounds great!! !